Reeth is a beautiful village in Swaledale with the River Swale flowing just to the south of the village. Reeth is known as the capital of Swaledale and is situated at the meeting point of two of North Yorkshire’s finest Dales, Swaledale and the most northerly Arkengarthdale, the latter relatively unexplored and one of the more tranquil dales. Reeth’s 18th century houses and three pubs /hotels are clustered around a triangular green and the village also has four tearooms, a bakery, ice cream parlour, a shop, a post office, many B & B’s and a market day on Fridays. In May and June the annual two week Swaledale Festival is held bringing many visitors and locals to Reeth to enjoy the small scale music and guided walks and every year on the last Wednesday of August the agricultural Reeth Show is held. Reeth is over looked by the fells of Fremington Edge and Calver Hill and is a great starting point for several of the North Yorkshire Dales best known walks one being Fremington Edge which after a steady climb provides fabulous views of Swaledale. In the 18th century Reeth became a centre for hand knitting and was the capital of the lead mining industry, but it was always a market town for the local farming community. Scabba Wath Bridge is an old bridge not used very much except by the local farmers and locals who live down the mainly single track road that leads to Grinton 3 miles to the left and Askrigg 6 miles to the right. Swledale is a very beautiful and typical limestone Yorkshire Dale with a narrow valley bottom road, the unpredictable River Swale, green meadows, fellside fields, white stone walls, limestone barns and lots of sheep. It runs broadly from west to east from the high moors of the Cumbria–Yorkshire boundary at the watershed of Northern England, where Nine Standards Rigg rises, to the market town of Richmond. 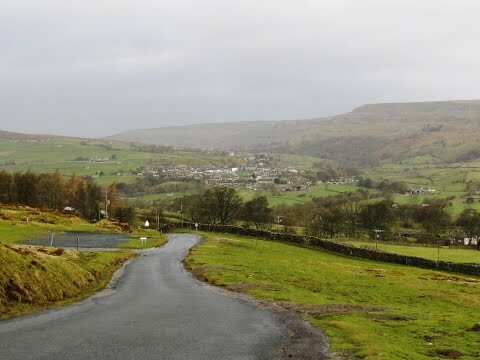 A number of small dales to the south of the rigg join to form the narrow valley of Upper Swaledale at the small village of keld then at the village of Thwaite the valley slowly broadens out to take in the villages of Muker, Gunnerside and Reeth before reaching Richmond. Swaledale is home to many types of flora and fauna. Over the last few years the national park has been restoring 495 acres of upland and lowland to bring the traditional hay meadows back to their former glory, as part of the Hay Time Project. The process of not cutting the grass for hay or silage until wild plants have seeded provides a profusion of wild flowers in the spring and summer. Tourism has become very important in Swaledale attracting thousands of visitors a year especially with walkers as The Coast to Coast Walk passes through the valley and there are many public rights of way and open access land for all the family to explore and enjoy in this wonderful dale of Swaledale. The River Swale is a major tributary of the River Ure which itself becomes the River Ouse and empties into the North Sea via the Humber Estuary. The river is one of the fastest rising spate rivers in England and can rise 3 metres in 20 minutes. The original Swing Bridge at Reeth was built in 1920 after the community helped to raise the money to connect the parishes of Grinton and Reeth. It stood for 80 years surviving several major floods until the night of Tuesday 19th September 2000 when it was smashed to bits by an uprooted tree during one of the rivers severe floods. An almost identical replacement Swing Bridge was erected in 2002. In this part of the valley the river is constantly changing its course and for centuries people have been trying to control the flooding that regularly occurs but the lead mining and the draining of the moorland has not helped. A traveller in the 1700’s wrote “the Swale rusheth rather than runneth”. From the car parking area, walk across the grass and walk up the alley way between the church and the Fat Sheep Dales Shop. Walk to the end of the alley way, turn right and follow the lane past the doctors surgery to a gate in front and a bench on the right. Turn left down the stone and grassy path, passing a barn, to the River Swale. Turn right over a small footbridge and head forwards through a gate to the swing bridge. Do not cross the bridge but head forwards with the river on your left following the path at the side of the river. Cross over two small footbridges and keep heading forwards through the trees then continue through the open fields passing Healaugh village that can be seen on the right. Note the path leading off to the right sign posted Healaugh. When you reach the stream (Barney Beck) that flows into the river there is no bridge, only stepping stones. Only cross if it is safe to do so then head forwards through the field and over a stile to reach the road. Turn left and follow the road to Scabba Wath Bridge sign posted 7 miles. (If it is not safe to cross the stream back track to the Healaugh path mentioned above and head across the field towards the farm. Turn left onto the road and continue though the village until you reach Scabba Wath Bridge sign posted Askrigg 7 miles). Cross over the bridge and turn left sign posted Grinton 3 miles. Just follow the tarmac single track road uphill for about half a mile with the wall on your left and when the wall bears left keep following it away from the road towards a line of trees. Go through the gate in the wall the river is down below on the left and head forwards following the wall now on the right then head downhill to go through a gate at the bottom close to the river. Keep following the grass path then a cobbled path (if this is flooded walk round through the field on the right) then continue on the grass path close to the river until you reach the swing bridge. Cross over the bridge turn right go through the gate and follow the track back over the little bridge up the hill past the barn to the track at the top turn right and follow the lane past the doctor’s surgery and left back down the alley way into the centre of Reeth. This is an easy mainly flat walk along both sides of the River Swale on grassy paths with some little footbridges and small tarmac roads. Only one incline and decline. Approx 4.75 miles allow 1 hour 45 mins using OS map OL30 Yorkshire Dales, Northern and Central Areas. Start and finish: at The Green, Reeth. Reeth in Swaledale in the Yorkshire Dales. From A1 take the A684 to Bedale. At the t-junction in Bedale turn right for Layburn. At the small roundabout at Layburn turn right and then left for Reeth. At the cross roads cross straight over and follow the road over the top and down to Grinton turning left at the t-junction then into Reeth. OR from the A1 and A66 junction take the A6108 through Richmond, carry on bypassing Marske and then take a right turn onto the B6270 to take you to Grinton then Reeth. Parking is central on The Green. There is a voluntary fee of £1. There is also some road side parking. There are public toilets at Reeth near the Buck Hotel and also at nearby Grinton. For refreshments there are three hotels/pubs The Black Bull, The Buck and The Burgoyne, four tea rooms, bakery, ice cream parlour, restaurant /diner, a small convenience store and on Friday evenings there is Ramsey’s Fish and Chips mobile van. There is also a pub at Grinton.